VarioSteam® - cooks foods moist on the inside and crisp on the outside. FullTouch Control - simple, precise oven control by fingertip touch on high resolution 5.7" TFT colour display. 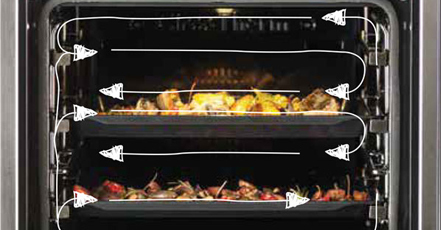 NeffLight - your food is always visible without having to open the oven door. 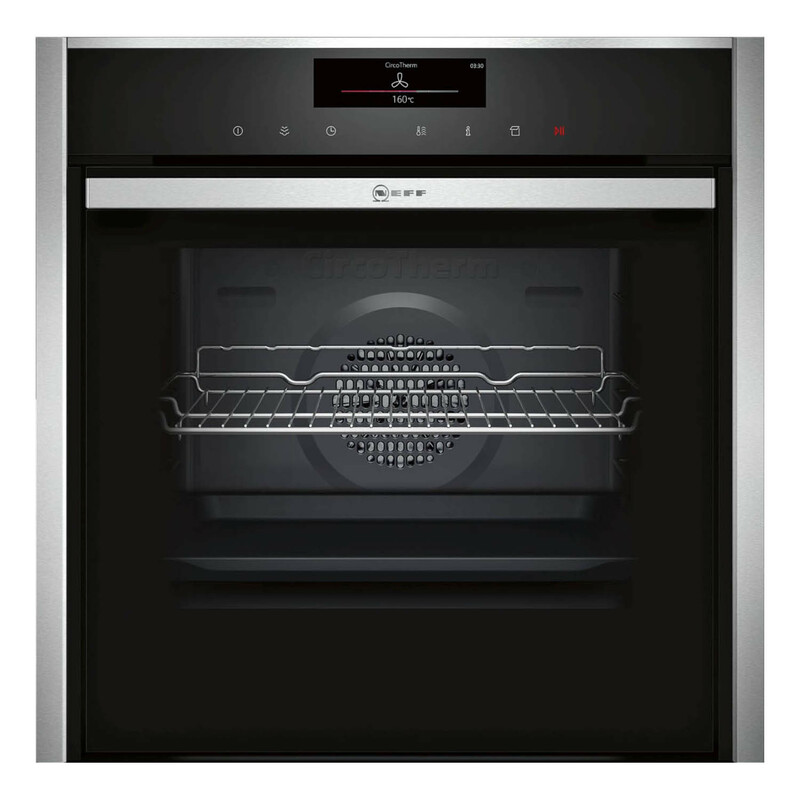 This smart and stlish Neff oven has many features offering a huge amount of cooking possibilities. Features include CircoTherm technology, the revolutionary Slide&Hide door, and Vario steam. You also have the added bonus of 1 comfort flex rail and a multipoint meat probe. 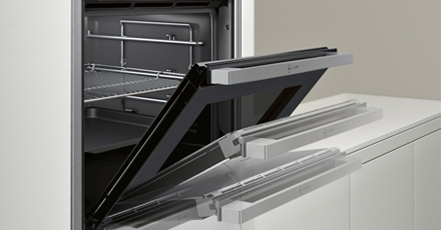 The Slide&Hide® disappearing oven door is unique to NEFF, it means that access to the oven cavity is completely uninhibited for safer, easier use. Perfect for hands-on cooks, it allows for flexible cooking, letting you baste, taste and monitor food easily during the cooking process. The Slide&Hide® door also provides a great space-saving solution in smaller kitchens, for example those with a galley-style layout. VarioSteam® is the solution for people who take advantage of a steam-assisted oven, while not wanting to lose all the qualities of a standard multifunction oven. 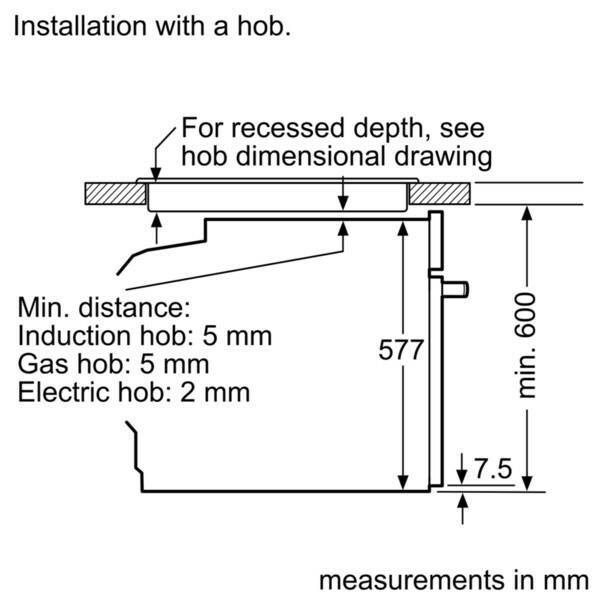 The steam support ensures optimum roasting and baking results. Moisture is added automatically to guarantee that food is crisp and succulent. 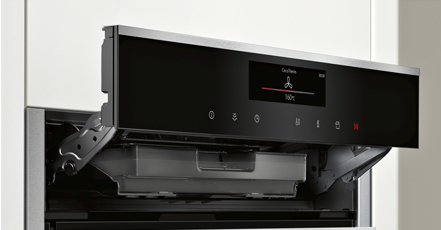 CircoTherm allows you to cook a three course meal at the same time with multi-level cooking and better still, have no flavour transfer across dishes. Get cooking faster with little or no pre-heating of the oven and in the process gain better cooking results because of even heat transference through the oven cavity. CircoTherm will also improve your grilling experience as you no longer need to turn food on the grill, the air circulates to give perfect results every time.